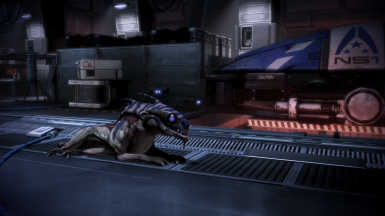 A small mod that replaces KEI-9 with Urz from Mass Effect 2, in a lore-friendly way. 1. UOTN is the creative work and property of Giftfish. I retain all legal ownership and rights related to title, copyright, intellectual property, and distribution of this mod and its contents. 2. This agreement grants you a license to use UOTN; it is not a transfer of ownership. A. Permissions for this mod are "closed". Any usage beyond playing, or alterations beyond a user's personal, private modifications, requires my express permission. B. You may not distribute, re-use, convert, translate, update, or modify, UOTN or any of its contents without my express permission. C. You may not release any patches for UOTN, including intermod compatibility patches, without my express permission. This includes but is not limited to: direct use of files or assets (theft) and/or recreation of file edits (plagiarism) in a way that replicates the mod's experience in game. The only way intermod compatibility with UOTN may be achieved without my express permission is via omission of the conflicting files in the incompatible mod. D. You may not use various programming or modding methods to hook into and alter UOTN's in game experience without my express permission. 4. UOTN is for noncommercial use only and is provided free of charge. You may not use this mod as part of any activity in which you derive revenue, monetary compensation, or donations. 5. You use UOTN at your own risk; I am not responsible for any damage to your game or PC by use of this mod. Technical support may be provided but is never guaranteed. 6. UOTN is hosted only on Nexusmods.com. Pirated copies obtained via private link or any other site are suspect and could contain malware or unauthorized modifications that will interfere with normal functionality of the mod. These copies are considered void and will not be supported. Users of unauthorized/pirated content may be banned from any present and future mods I create. Modders interested in acquiring translation or patching permissions should visit the ThaneMOD website's "For Modders" section for details. --Changed the KEI-9 POI to "Urz - Talk"
20 Mar 2018 -- Bugfix for Leviathan users is available! 12 Mar 2018 -- UOTN v2.0 is available! 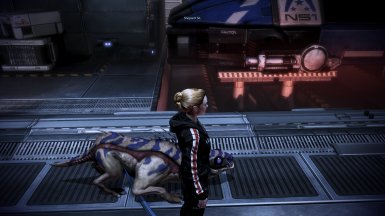 Urz on the Normandy (UOTN) is a small, simple mod for Mass Effect 3 that replaces KEI-9 with Urz from ME2 in a lore-friendly way. The original idea for UOTN came from ELE08/UserDomainError's Varren on the Normandy, which despite its obvious awesomeness, has some drawbacks with technical implementation and immersion. are listed below to help you decide if you want to download the mod. 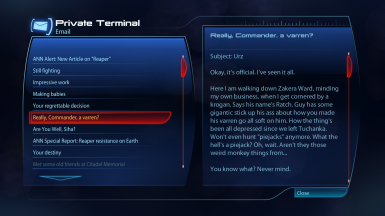 Urz in ME2. 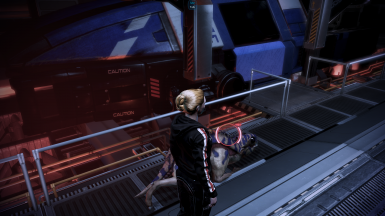 UOTN requires that you’ve fed Urz in ME2 to function. Without meeting this condition you will not be able to access Urz (or KEI-9). 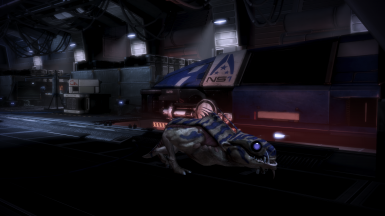 The ME3 Collector's Edition is not required for the mod to work. English. UOTN is made for English localizations, only. If you have another localization, I cannot guarantee functionality, nor can I provide technical support. Do not ask. Instead, read here﻿ more information on my mods and localizations. DLL Patcher. UOTN requires use of a DLL Patcher so ME3 can load new DLC. If you have DLC mods installed, then you already have this patcher. If not, then it must be downloaded and installed, separately. See the install guide for details. For users of my other mods, Urz requires no additional compatibility patches. UOTN is explicitly compatible with Expanded Galaxy Mod (EGM), but folks need to make sure they are using the most recent version of EGM. EGM mechanics allow both Urz or KEI-9 to be used in the playthrough; see EGM’s documentation for details. Users should read more about compatibility, patches, and conflicts here and here. Modders interested in creating compatibility patches or translations for my mods should refer to this page.